Welcome to our second wristband blog post! Thank you for joining us as we navigate this new adventure of blogging. We are so glad to share this with you. Because we love our customers, we decided this week to give you a guide to our colorful wristbands. Each color listed are a glimpse of all the colors we offer at RapidWristbands.com. 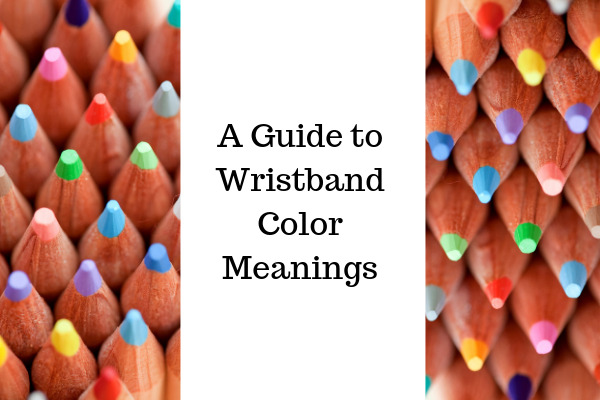 Each wristband color has a meaning, and more often than not, they correspond with an awareness topic. Read below to see which meaning and awareness topic corresponds with its color, listed in the order of a rainbow. Meaning: Passion, energy, ambition. Can also represent anger. Meaning: Love and nurturing. Can also be girlish. Meaning: Optimistic and cheerful. Represents the mind. Meaning: Balance and growth. Can also represent greed. Meaning: Spirituality, grace and truth. Meaning: Imagination and creativity. Can also mean royalty. Meaning: Compromise or indecision. Can be unemotional and detached. To order your colored wristband, click the button below! In addition, click here if you're interested in learning more information about awareness.